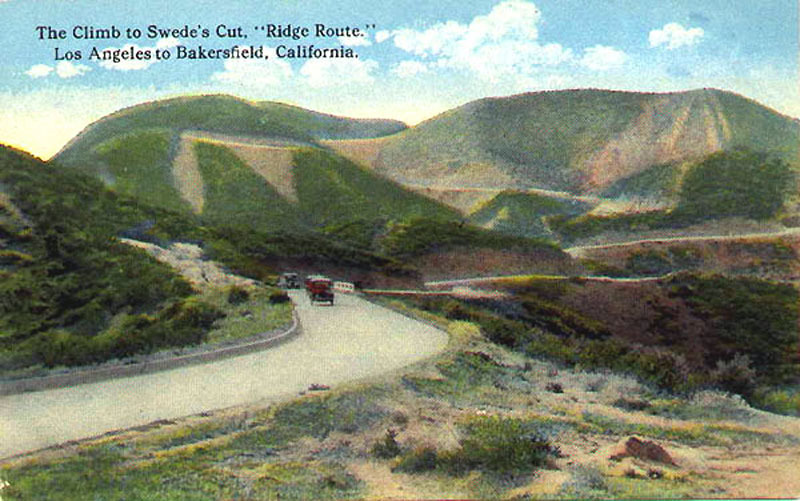 Postcard showing the "Climb to Swede's Cut" along the Los Angeles-to-Bakersfield "Ridge Route," probably 1920s. After a year of toil, during which four-horse Fresno scrapers graded hilltops alongside chugging Caterpillar tractors to the tune of a staggering half-million dollars, the Tejon Route, as it was originally dubbed, opened to the motoring public late in November 1915. The Auto Club did a little calculating, finding that in the 36 miles between Castaic and Gorman, there were 642 curves that added up to 97 complete circles. It did cut 60 miles off the road, however.